How to choice Christmas menu ideas? Deciding on these ideas become top priority every year as soon as Thanksgiving is over. Each holiday season has its own unique flavor and characteristics. We have old traditions that have been passed down through the years and then we have new traditions which we may start. This is a time when friends and family join together for meaningful get-togethers. These good times are celebrated with special and memorable foods. I have learned how to choice Christmas menu ideas each year in the Fall. It seems atop of my list the recipes are always sweets. For me it is always updating my huge list of Christmas cookies, special holiday cakes, a variety of fudge and candy and of course, sweet breads and sweet rolls. I read somewhere one time that the way we cook is compared to the music we prefer. If we like classical then we cook from scratch. Those who like contemporary music usually choose trendy recipes and ones made from convenient products. However you choose to cook and bake, the holidays bring about some of the very best recipes. After we organize all these sweet delicacies, it is time to make a decision about the center of the meal. 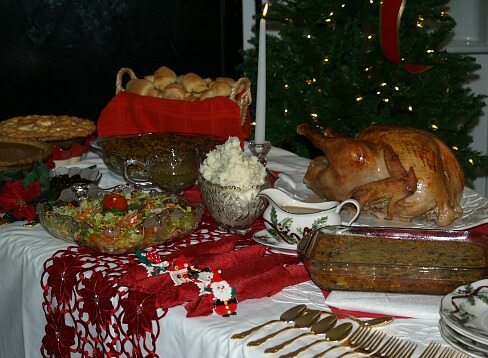 I learned how to choice Christmas menu ideas by starting with the main entree or the “main event”. Each year I try to come up with something different and special; a little more special than the year before. If you can come up with a special entrée or focal point of the holiday meal, it is easy to throw in some side dishes to make an elaborate celebration meal. 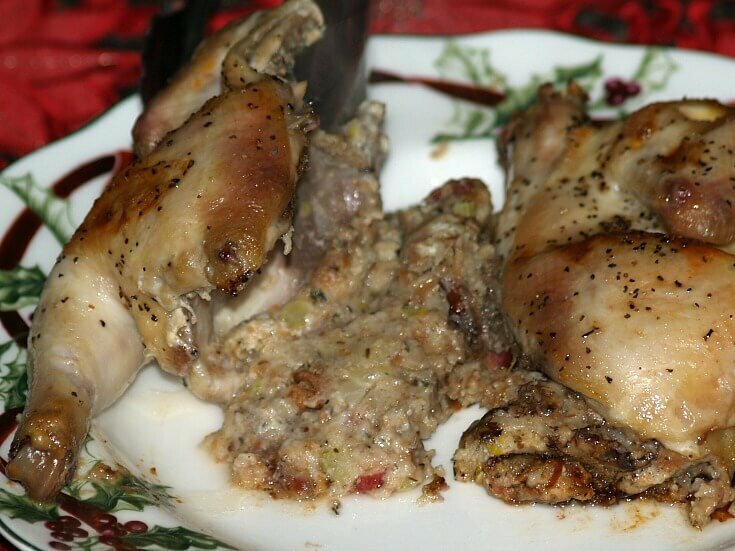 The stuffed Cornish hen is one of my favorite entrees of my Christmas menu ideas. It is very easy to adjust the number of servings for however many guests you will have. This is truly an American idea thanks to the breeding of these hens here in this country. Each of these hens weigh three fourths to one and one half pounds; each suitable for one serving and holds about one cup of stuffing. However true this is, I always prefer to split each hen in half placing the stuffing under each half; serve by lifting both stuffing and bird to the plate at once. I still allow for one hen per person but I find it more convenient and less challenging for guests to eat in halves with utensils. It is improper to eat the birds with their fingers; this is something to consider when planning all the Christmas menu ideas. One of the great traditional Christmas menu ideas is a roast goose recipe but that gave way to the turkey in the mid to late 1900’s. This happened for several reasons. First the goose was becoming so common that people were looking for something new and exciting for their holiday meals; just like we do today. The turkey became so popular also because it was so cheap; I can remember them being for sale for twenty nine cents a pound. A large turkey will feed a lot of people and the meat is very good. A large Christmas goose recipe would feed about half as many as the turkey because it has a lot of fat; the fat melts during cooking and leaves far less meat for the meal. 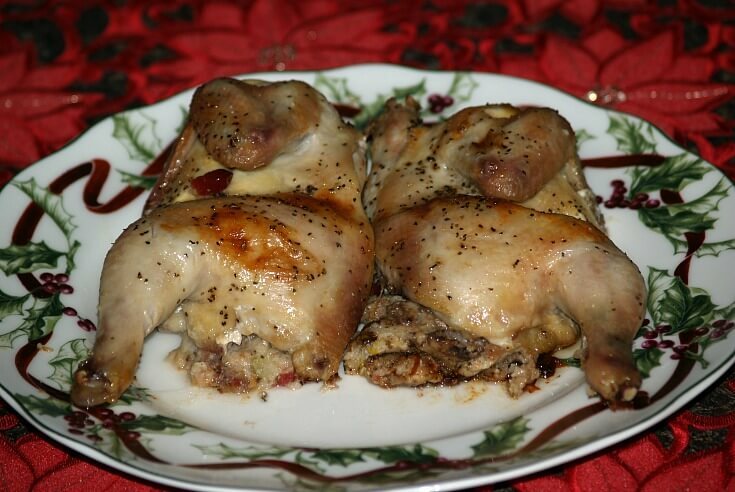 There are still many who love the flavor of roast goose recipe so this is an option of something “different” now for your Christmas menu ideas. There are some of us who must offer beef on our list of Christmas menu ideas. 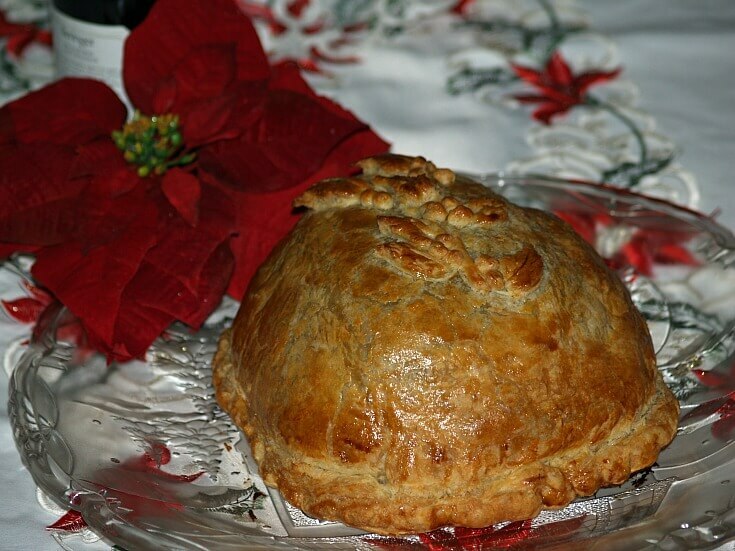 This Beef Wellington Recipe is a very special and elegant recipe for the holidays. As I have often stated, I love using puff pastry for a variety of recipes. It offers a beautiful presentation when encrusting many different entre recipes. When wrapping a tender beef tenderloin, it makes the most elaborate of all beef entrées. What is even nicer is that the puff pastry can be purchased and is so easy to prepare. This Christmas menu idea is an old one for me. They always turnout good and you can use a variety of stuffings. Cut hens in half from middle of breast to middle of back; rinse with fresh water and pat dry. Combine seasoning packet from stuffing mix with water and celery in a saucepan. Bring mixture to a boil, cover, reduce heat and simmer 5 minutes. Add ¼ cup of the cream cheese and stir until blended. Blend in breadcrumbs from package, cranberries and pecans; remove from heat and let stand 5 minutes. Carefully loosen skin from hen halves without totally removing skin. Divide remaining cream cheese among hen halves and spoon some under each ones skin. Spoon about ½ cup stuffing onto a lightly greased pan with sides; top each with a hen half. Brush each half with oil or butter; season with salt if desired. Bake in preheated oven about 60 minutes until hens are done; if browning too much lay foil on top. To serve lift stuffing and hen half to dinner plates. NOTE: Serves 8; I allow 2 halves for adult men. What was at one time common for Christmas menu ideas is now very special. Remove giblets and neck from goose and place in pot; cover with water, bring to a boil. Cover with lid, reduce heat and simmer 1 hour or until tender. 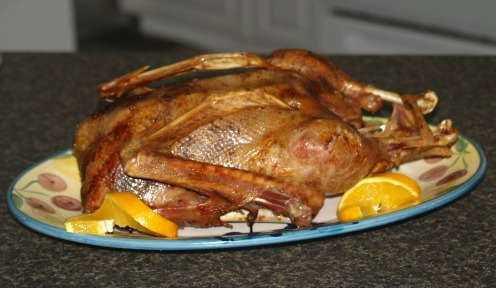 Remove fat from goose body, wash goose in cold water and pat dry; refrigerate until ready to stuff. To prepare chestnuts place in Dutch over high heat and cover with water; bring to a boil. Remove pan from heat and with slotted spoon remove 3 to 4 chestnuts at a time to cutting board. Cut each in half and scoop out the chestnut meat cutting any large pieces into small pieces. Continue until all have been processed into a bowl; discard water in Dutch oven. Remove giblets and neck from cooking pan reserving broth for stuffing and gravy. Coarsely chop all meat from giblets and neck to use in stuffing; discard neck bones. To prepare stuffing for this Christmas menu idea melt 4 tablespoons butter in same Dutch oven. Add celery and onion and sauté until tender. Remove pan from heat and stir in bread, prunes, parsley, chestnuts, giblet and neck meat. Season mixture with 1 Teaspoon salt and ¼ teaspoon ground black pepper. With goose breast side up lift wigs toward neck and fold under back to stay in place. Spoon remaining stuffing lightly into body cavity; fold skin over and fasten with skewers. Place goose breast side up on rack on open roasting pan. Rub goose with sage, salt and pepper. Insert meat thermometer into thickest part of meat between breast and thigh. Roast in preheated oven at 350F degrees for about 3 hours or until thermometer reaches 180 to 185F degrees. To prevent too much browning the last hour of roasting cover with foil. After 2 hours of roasting start preparing vegetables. Peel carrots and parsnips; bring to a boil over high heat; reduce heat and simmer 20 to 30 minutes until tender. Drain vegetables; in skillet in 3 tablespoons melted butter brown vegetables turning gently. Sprinkle with salt, remove from heat but keep warm. Cut potatoes in half; brown in skillet in melted butter turning occasionally. Reduce heat under potatoes, cover and cook until tender; sprinkle with salt and keep warm. When goose is done remove to warm platter; keep warm and make gravy. Pour pan drippings through a strainer; let stand until fat separates from the juices. Measure out 1 ½ tablespoons fat into 2 quart saucepan; discard remaining fat. Add enough reserved giblet broth to meat juice to make 1 ¾ cups to fat in saucepan. Combine 2 tablespoons flour and ½ teaspoon salt; gradually stir in ¼ cup milk and ¼ cup Marsala until smooth. Blend milk mixture into broth in saucepan; heat and cook while stirring until mixture thickens. Stir in ¼ teaspoon ground black pepper to season. 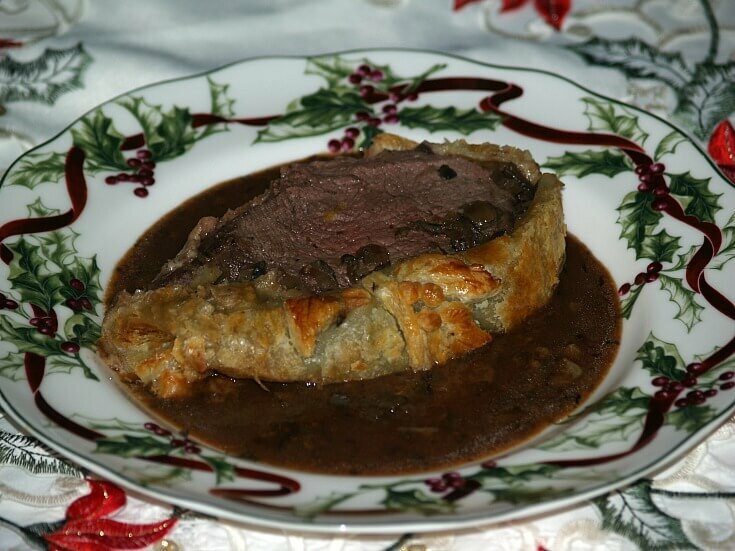 As a Christmas menu idea or for any special event of the year, this beef wellington recipe reigns supreme for all beef lovers. Brush meat with 1 tablespoon melted butter; insert meat thermometer in thickest part of beef. Roast beef about 30 minutes until thermometer reaches 120F degrees very rare. Remove from oven and let stand 30 minutes (Leave oven on). In skillet over medium heat in 3 tablespoons hot butter, sauté onions until tender. Add mushrooms, thyme, salt and pepper; stir and cook until all liquid evaporates. Stir in red wine and cook until mixture is dry; remove from heat and cool slightly. Place tenderloin roast in center on top of pastry; with knife cut pastry leaving a 1 around roast. NOTE: Reserve trimmings for decorations. 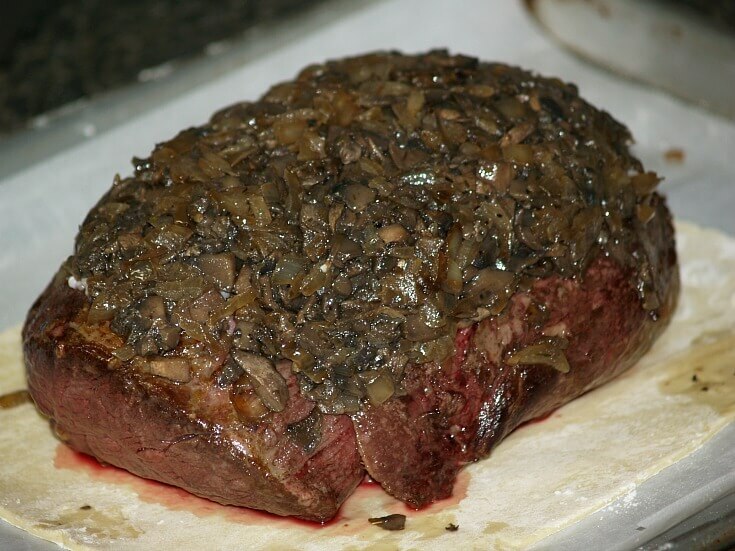 Spread bacon over tenderloin roast; top with mushroom mixture. Brush egg white on pastry around roast edge; roll second sheet of pastry to same size as before. 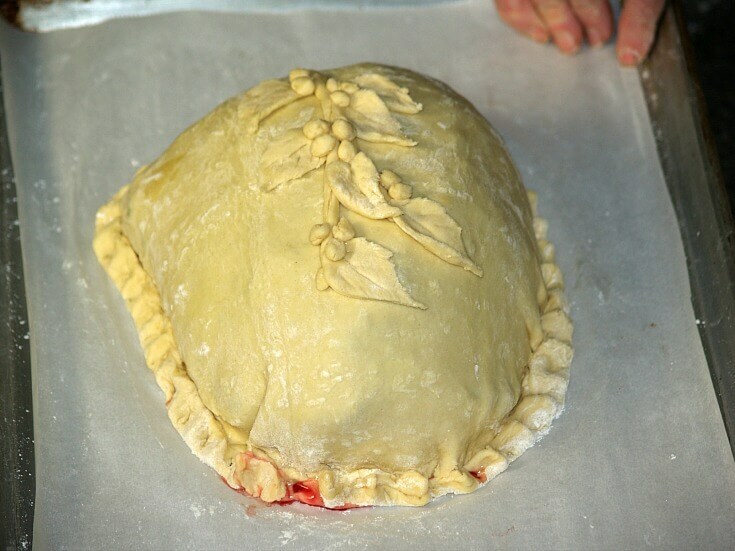 Lay pastry loosely over tenderloin pressing pastry around base to seal. Trim pastry if needed; crimp base border to make a pretty edge. Use trimmings to shape pretty leaves and roll little balls to make holly berries. Use egg whites to attach to top crust. Beat egg yolk with milk; brush top and sides of crust with egg mixture. Place in oven and bake 10 minutes at 425F degrees. REDUCE OVEN TEMPERATURE TO 375F degrees and bake 20 minutes longer or until crust is golden. Melt 3 tablespoons butter in heavy saucepan; sauté 1 tablespoon minced onion until tender. Stir in 3 tablespoons flour and cooked until browned. Add 1 tablespoon chopped parsley, ¼ teaspoon dried thyme and 1/8 teaspoon black pepper. Slowly stir in 1 can (10 ½ ounces) beef broth, ½ cup red wine and ¼ cup water; increase heat. Cook and stir until sauce boils and thickens.